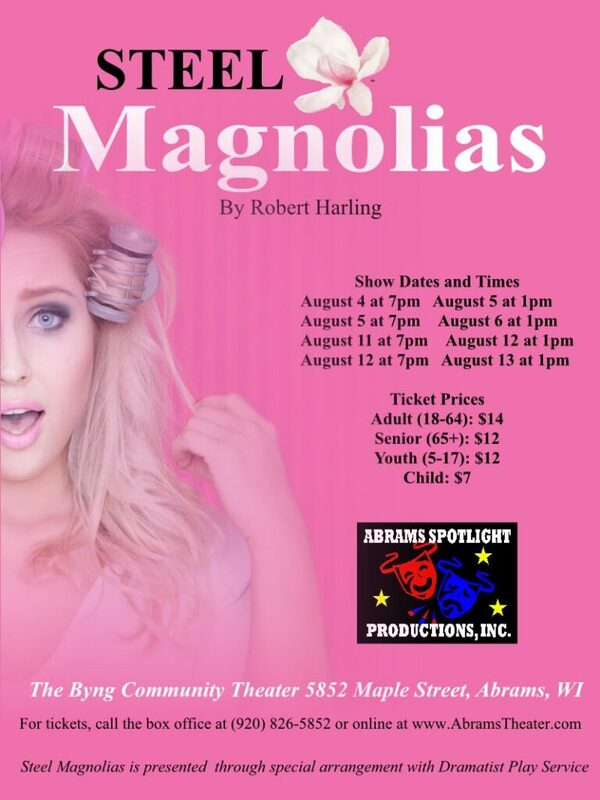 Abrams, WI May 19, 2017: Abrams Spotlight Productions will hold auditions for its summer show, “Steel Magnolias,” a production full of sass, style and sisterhood. Written by American playwright Robert Harling and based on his experience with his sister’s death, the show is set in Louisiana in the 1980s and is equal parts hilarious and heartwarming. At Truvy’s beauty shop, the motto is: “There’s no such thing as natural beauty.” Gossip, revelations, and witty Southern banter flow like refreshing sweet tea on a hot summer day. Through clouds of hairspray and over the buzz of blow dryers, six southern spitfires gather each week to chat and support each other through thick and thin. The play was adapted as a film released in 1989 which earned Julia Roberts an Academy Award nomination for her portrayal of Shelby. Infused with heart and humor, “Steel Magnolias” is a story of love, loss, and enduring friendship. Auditions will be held from 6-8 p.m. Tuesday, June 6, and Wednesday, June 7, at the Byng Community Theater, 5852 Maple Ave., Abrams. The play calls for six adult females of various ages. Women auditioning will be asked to read from the script. Newcomers are encouraged and welcome to audition! Back-stage volunteers also are needed, so consider sharing your time and talent. The show will be performed Aug. 4-6 and 11-13 at the Byng Community Theater in Abrams. Rehearsals are set for Sundays and Thursdays. For more information about auditions or to volunteer, call 920-826-5852. This entry was posted in Uncategorized on May 19, 2017 by packerland. Looking for something new? Time for After Dark! By now our patrons have been seeing snippets of information related to After Dark Productions and the 25th Annual Putnam County Spelling Bee. What is After Dark Productions you may be asking yourself? Well, to sum it up, it is FUN! After Dark Productions is an education based theater group created by Abrams Spotlight Productions and Directed by Kari Devine. You were introduced to Kari in our April newsletter. It was Kari who came to the Board of ASPI with the idea of doing 1 show a year that was edgier and focused on adult themes. She also came up with the idea for After Dark Productions. “Anyone involved is working with staff and resources from the semi-professional or professional theater levels” Kari says. ASPI received feedback from patrons and past actors that there was an interest in adult only theater experiences, which resulted in the creation of After Dark Productions, along with Kari Devine’s guidance. The goal of After Dark Productions is to produce edgier productions geared towards the adult only crowds. 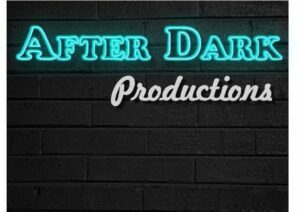 When you see “After Dark Productions”- you are in for a wild ride! The 25th Annual Putnam County Spelling Bee will be running September 15-17 and 22-24. Go to www.abramstheater.com for more information. Tickets go on sale SOON! Announcement will be made on Facebook! This entry was posted in Uncategorized on May 4, 2017 by packerland.